During National Immunization Awareness month, we are proud to spotlight Sarah Irsik-Good and the Kansas Foundation for Medical Care (KFMC), for their efforts to promote awareness and utilization of adult vaccines all year round. As the current President and CEO of KFMC Sarah Irsik-Good leverages her nearly 20 years of experience in healthcare delivery systems to encourage adult immunizations throughout Kansas. Ms. Irsik-Good provides technical direction and operational leadership for the Medicare quality improvement work across Kansas. She also holds a leadership position at the Great Plains Quality Innovation Network (GPQIN), of which KFMC is a member. GPQIN works with healthcare providers and communities to implement data-driven quality initiatives to improve healthcare. All adults should receive recommended vaccines to protect their health. More than 50,000 adults die every year from vaccine preventable diseases, and thousands more suffer serious health problems that can be prevented by immunizations. Vaccines are especially important for older adults. A few years back, Ms. Irsik-Good and GPQIN started asking the question “what prevents seniors from getting immunized?” They soon recognized that public awareness was critical to facilitate conversations between providers and adult patients about vaccinations. “How can we expect vaccine rates to improve if so many adults are unaware that they also need vaccinations?” asks Irsik-Good. In 2016, GPQIN began an outreach and awareness campaign to increase immunization rates for adults. 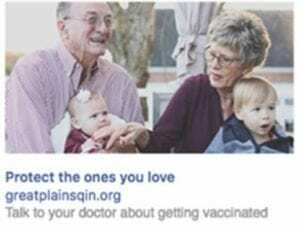 With mailings, billboards and bus signs throughout Kansas, GPQIN encouraged consumers to visit their providers and discuss all recommended immunizations. The messages, including “Don’t Wait, Vaccinate!” and “It’s Not Too Late to Vaccinate,” stressed the importance of getting vaccinated now in order to avoid expensive and damaging health complications later. Incredibly, the campaign engaged vulnerable Medicare and Medicaid consumers in rural areas across the state. The awareness campaign expanded in 2017 to Facebook ads, engaging beneficiaries, caregivers and family members in the immunization improvement campaign. This work, coupled with outreach to providers, pharmacies and local health departments/community-based agencies, has allowed for further engagement of beneficiaries, caregivers, and their family members. Vaccine-preventable diseases are just that – preventable! Increased awareness is critical to improving adult vaccination rates and reducing the rates of preventable, expensive, and harmful diseases. By building awareness and knowledge, changing key attitudes and beliefs, and contributing to behavior changes, these campaigns proved tremendously successful and reached large expanses of rural Kansas. AVAC thanks Ms. Irsik-Good and GPQIN for their hard work towards growing public awareness of the need for adult immunizations!